Former Local Government minister Saviour Kasukuwere has asked the High Court to review a Harare magistrate’s decision to dismiss his application for exception to the criminal abuse of office charges. During his trial on several charges of criminal abuse of office, Kasukuwere, through his lawyers, made an application for exception to the charges, arguing that the facts, as presented by the State, did not disclose any offence, but his application was dismissed by regional magistrate Hosea Mujaya. “The present application is an application in terms of section 27 (1) (b) and (c) of the High Court Act for review of a ruling made by the first respondent (Mujaya) on an exception which I took to the charges which are being preferred against me. The ruling was made by the first respondent on November 29, 2018,” Kasukuwere said. The former minister said the basis of his application was that Mujaya’s ruling was outrageous “in its defiance of logic” that no reasonable magistrate, applying his/her mind could have arrived at such a ruling. “From a consideration of the ruling, it is apparent that the first respondent did not apply his mind to the exception which was presented before him. He did not address the fact that the charges preferred against me did not disclose an offence in the absence of a statement of what duties I am alleged to have breached. Undoubtedly, the first respondent was biased and showed interest in the proceedings,” he said. Kasukuwere added that when Mujaya attempted to address the exception application before him, it was apparent that he had sight of the statements from witnesses or had heard evidence outside court and in the absence of his lawyers and himself. “I do not know how the magistrate looked at the evidence from witnesses who had not yet testified and before I had been asked to plead to the charges,” he said, adding: “His statement that the evidence looks relevant to the matter on hand amounts to an assessment of evidence which has not been led. 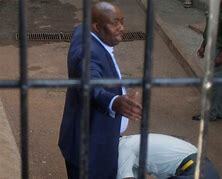 It means that the trial of the matter will be farcical,” Kasukuwere said.